Second round line-up at the Central Coast Pro Tennis Open is set. Grace Min admits she’s rather play on her favorite surface of clay, but settled into the hardcourts just fine on Wednesday with a first-round win over qualifier Maegan Manasse at the Central Coast Pro Tennis Open, a $60,000 USTA Women’s Pro Circuit event taking place at the Templeton Tennis Ranch. Min has split two matches against her second-round opponent Jessica Pegula already this year, with both three-set matches coming on clay. Back in June on the clay at Bethany Beach, Del., a $25,000-level Pro Circuit tournament, Min beat Pegula in the quarterfinals on the way to her 10th USTA Pro Circuit singles title, and first of 2018. She started the year strong by reaching the final at the $25,000 event in Daytona Beach, Fla., the first tournament of the 2018 season. Min currently trains at the USTA National Campus in Orlando, Fla., and is ranked No. 248 on the WTA Tour. Also winning first-round matches Wednesday in their native California were Maria Sanchez and Asia Muhammad. Sanchez, a former USC star from Modesto, beat No. 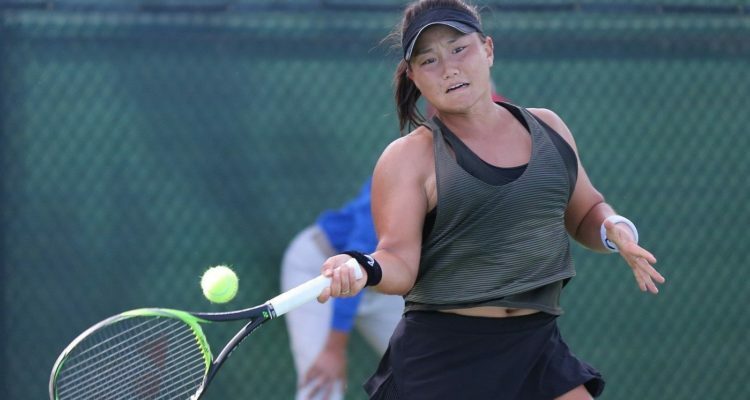 5 seeded Kristie Ahn, dropping just two games, 6-0, 6-2, and former Southern Californian now from Las Vegas took out former USC All-American and last year’s Templeton doubles winner Giuliana Olmos, 6-3, 3-6, 6-0. Muhammad is currently ranked in the world Top 100 in doubles and won her third WTA-level doubles title in Quebec City with Sanchez the week after the US Open. Muhammad and Sanchez are seeded No. 1 in Templeton this week in doubles. In the night match, top-seeded Taylor Townsend returned to Templeton victorious in a battle of lefties who have won US Open Junior Girls singles titles. Townsend, coached this week by longtime mentor Donald Young Sr., beat Santa Barbara’s Kayla Day, 6-1, 6-4. Following that match and in a battle of wild cards, former Arroyo Grande High star and Gonzaga University senior Sophie Whittle opposed last year’s doubles partner, Arroyo Grande High senior Delanie Dunkle from just up the road in San Luis Obispo. Whittle and Dominique Schaefer took out Dunkle and Christine Maddox, 6-4, 6-2, in front of an enthusiastic Templeton Tennis Ranch crowd. Quinn Gleason, U.S.-Luisa Stefani, Brazil, def. Kai-Chen Chang, Taipei, def. Ching-Wen Hsu, Taipei, 1-2, ret. This entry was posted in ITF World Tennis Tour and tagged Central Coast Pro Tennis Open, Grace Min, ITF Pro Circuit, Templeton.